October 26, 2017 | News Brief | Eos Energy Storage has announced the installation and commissioning of a 250 kW 1 MWh Eos Aurora DC battery system at the wastewater treatment plant in the Borough of Caldwell, NJ. 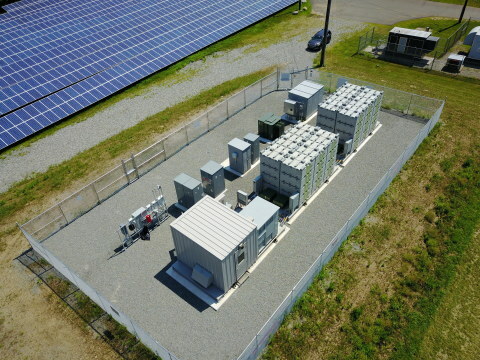 The batteries are a central component of Public Service Electric and Gas Company’s (PSE&G’s) on-site solar-plus-storage microgrid that will help keep the facility operating during extended power outages. The Caldwell microgrid is part of the New Jersey utility’s Solar 4 All program. The microgrid includes an Eos Energy Storage system and an 896 kW-DC solar PV system designed and installed by Advanced Solar Products of Flemington, NJ. Siemens Energy Management integrated the Eos Aurora system, solar facility, and existing diesel generator, using the Eos Znyth battery technology as the backbone of the microgrid to reinforce emergency resiliency for this piece of critical municipal infrastructure. Siemens also provided the intelligent control technology to monitor, manage and distribute power across the system. The solar and battery storage systems are connected directly to PSE&G’s electric grid. Under normal conditions, the solar panels deliver power to the grid and the battery storage system can provide value-added grid services for integrating solar onto the grid and participating in ancillary markets. The Caldwell wastewater treatment plant microgrid is part of a 3 MW-DC portion of the Solar 4 All program. The initiative develops projects that integrate solar with other technologies to reduce the impact of solar on the grid or to demonstrate reliability and grid resiliency of solar for critical facilities during prolonged power outages. The solar installation, combined with Eos’ long-duration energy storage, significantly extends backup power capacity and emergency operation of critical water treatment capabilities. Construction of the solar-plus-storage system at the Caldwell wastewater treatment plant was a joint effort between Advanced Solar Products, Eos, and Siemens Energy Management. The Eos Aurora battery system was selected on the basis of its multi-hour duration and the benefits of its simple, sustainable and inherently stable zinc hybrid cathode design. “Increasingly, we are deploying batteries as an add-on to solar not only because they provide critical power reliability when needed but also because they can generate revenues when the grid is up and running,” said Lyle Rawlings, CEO at Advanced Solar Products. The integrated product solution combines Siemens’ AC power conversion and intelligent controls with Eos’ modular Energy Stack design to enable quick deployment and ease of maintenance. The project is backed by Siemens’ installation support and warranty services.